So, your check engine light just came on. It could mean any number of things. Most repair shops will do a diagnostic check for free. However, just because a code came up it doesn’t mean you need a major repair. For example, if a code comes up about your O2 sensor; it does not always mean you need new O2 sensor. Be wary of shops who read your code and immediately suggest you need a major repair. You need to be able to trust your mechanic and know that he is only doing the labor and repairs that are necessary. At C & C Auto Service in Raleigh, NC we know some shops can be less than honest, that is why we do everything we can to let our customers know what needs to be done exactly and only do the work that is necessary. We place a high premium on customer service and strive to go above and beyond what our customers expect every time. Our technicians will answer all of your questions prior to doing any work, and make sure you completely understand what is going on with your auto repair. If your light comes on don’t delay getting it checked out, that can lead to more complex and expensive repairs. We are able to work with budgets and have financing available for those who qualify. We pride ourselves on being honest and dependable. Our customers know that they will be treated fairly and get the quality repairs they deserve at a fair price. The next time your check engine light comes on give us a call at (919) 348-2587 or schedule your appointment online today. C & C Auto Service understands how frustrating your car not working properly can be. 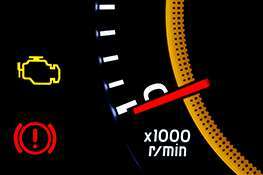 Your check engine light is a mystery to figure out without a properly equipped mechanic. Our Certified ASE Technicians will help you get your car back on the road. Using only the best tools and diagnostic equipment available to diagnose and pin point where the problem is. From car inspections to brake service C & C has got you covered. We have a comfortable waiting area with free Wi-Fi, bottled water and coffee available while you wait. Loaner cars and a free local shuttle are also available to get you home or to work. We want our customers to be repeat customers, that is why we will always go above and beyond when repairing your vehicle. Open Monday through Friday from 8am to 6pm and Saturday from 8am to 4pm. Conveniently located close to NC State University Campus. Across the street from Food Lion and Wicked Taco. Call or schedule your appointment online today to have your check engine light diagnosed.